"This is great as a party appetizer or a full meal. Tasty, full of flavor and good for you. The crunchy crust is what I really like! 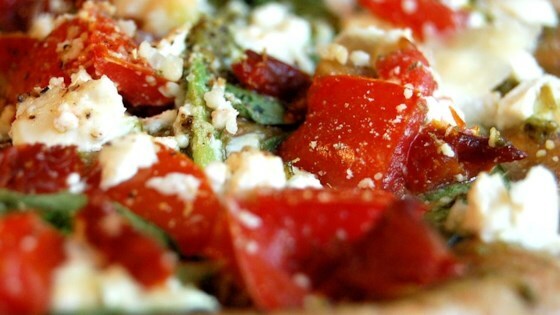 You can play with the veggie toppings and cheeses for a great meal that is fast and delicious! Our favorite quick meal!" Easy pizza to pull together and full of flavor! I made this with regular pesto but used all the ingredients that it said to use. To me it was too bland, definitely needs more spices and salt! We didn't have roasted tomato pesto, so we substituted regular pesto for it, and added bottled roasted tomatoes and it still came out great. Excellent recipe and very easy to make. Delicious. The recipe doesn't tell you what to do with the tomatoes, so I just added them after the spinach but before the cheese. Go very heavy on the spinach; it shrinks up a lot! !